You can’t believe everything you read, but you can believe this. Honest. As I’m writing this, I’m watching the film “Conspiracy Theory,” which has that great opening with Mel Gibson’s paranoid cabdriver character driving around and ranting about politics and government to a captive audience, his passengers. Wait a minute. That’s not Mel Gibson. And this isn’t “Conspiracy Theory.” It’s the news! A lot of crazy ideas are floating through the airwaves these days, and some of them seem to be coming from members of a formerly respected profession. You’ve probably heard them, spewing stuff about secret leaders and fake deaths and plots to kill Big Bird or some such nonsense. What kind of journalist would perpetuate ridiculous, far-fetched scenarios and present them as news? Everybody knows the real truth about the world. This country actually is run by the performers who have portrayed Col. Sanders in the KFC commercials. The Cabinet includes Darrell Hammond, Norm Macdonald, Jim Gaffigan, George Hamilton, Rob Riggle, Billy Zane, and Jason Alexander, and it’s led by Reba McEntire. There’s no plausible explanation for her to dress up as Col. Sanders otherwise, so that’s as good a theory as any. 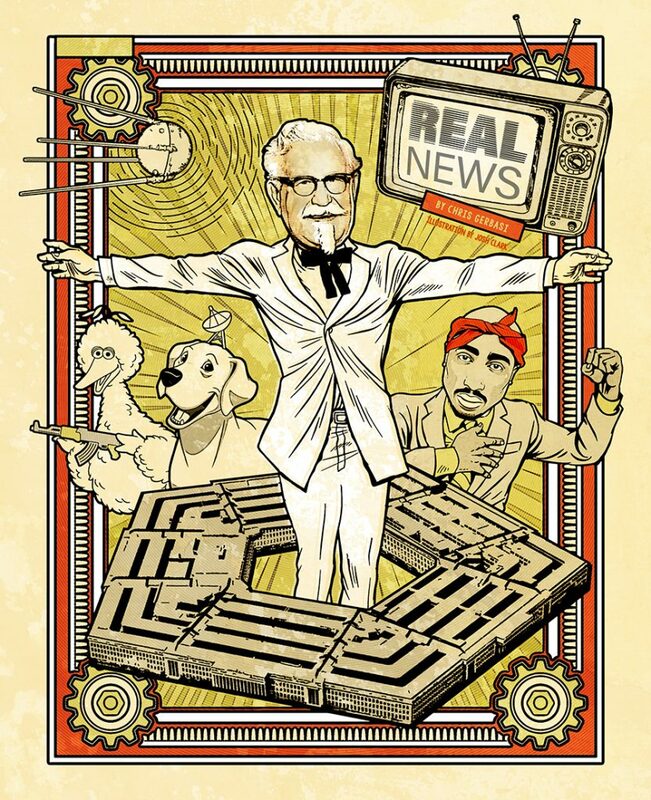 The real Col. Sanders, of course, is still alive and running the Pentagon. Elvis is the secret head of the Food and Drug Administration. JFK and Marilyn Monroe are keeping tabs on things from a private island, which makes perfect sense since the president of our country is their love child. They all share a resort hotel, probably a Marriott or a Red Roof Inn, with Jim Morrison, Tupac, Amelia Earhart, Andy Griffith, and Stalin’s body. It’s not just the humans running the show, though. Everyone cites George Orwell’s “1984” and makes ominous references to “Big Brother is watching.” But have you ever thought about Orwell’s “Animal Farm,” where the animals revolt against their “oppressors”? It’s not a satire, it’s a true story. Barnyard animals are coming after us. And who do you think backs up the KFC Cabinet? Those “Eat Mor Chikin” cows from the ads—they have the ability to make signs and who knows what else (though I can’t understand why such talented cows aren’t better spellers). Look out close to home, too. You’ve always privately wondered whether the neighborhood dogs are controlling your mind—and your TV remote. They are. “Dog spelled backward is god.” You’ve heard that meaningless observation all your life and never gave it any thought, but now you better. Oh. My. Dog! The dogs are in cahoots with the Russians, who transmit secret spy messages between the lines of resolution in old non-HD TV shows—only dogs can perceive them. Why do you think your dog loves watching MeTV? The Russians prefer to transmit via “Charlie’s Angels.” The dogs, naturally, prefer “Lassie.” Man’s best friend, my buttocks. But this is scarier than anything else that’s going on in the world: the real leader of the free world…operating from a heavily guarded bunker in western Australia…brace yourself…it’s Paul Hogan! The actor has been biding his time since “Crocodile Dundee.” It’s no coincidence that he’s holed up in a place called Gibson Desert (as in Mel Gibson), which is located between Lake Disappointment (also like Mel) and Lake Macdonald (like Norm). It all ties together like every logical conspiracy theory should. Hah! Fortunately, an underground network of moles is working on an anti-Dundee campaign. Not moles as in spies; actual moles. Underground. We should be fine. Still, I feel like I’ve said too much. It may not even be safe to print this article—or read it. I urge you, without hesitation, to rip out these pages, crumple them up, put them in your mouth, and eat them. (Online readers, eat your laptops.) A nation depends on it! Later, as nature takes its course and the pages go through your digestive system, the end result will amount to what passes for news today in our society. And that’s the truth.